Spain metal wall art by Samot Guil Velasquez originates from Spain, indeed. Mind this is not Spanish metal wall art which are rather objects made with wrought iron, such as artful metal gates. Around Easter 2012, I discovered one of such highly interesting paintings by Samot, as depicted below. It was at the Manufactum shop and gallery in Puerto de la Cruz Tenerife Spain. The whole color scheme of the Gallery Manufactum set off this Spain wall art by Samot to perfection. Notice how almost half of the left side of the painting makes up the focal point. And that is the metal art. The top part of a bald creature alludes to the new Spain Millenium fashion for men. No hair is needed to adorn the head. Big, slanted white eyes with black pupils dominate in the picture.. All the rest of this ET-type person shines like stainless steel. It's superb, while the rest of this Spain metal wall art reminds a rural scene of Tenerife with a cottage and a Dragon tree. All that is done in vibrant colors in oil. This work by Samot is not fine art but superb in its own right. Spot how the artist has signed the painting with Samot. His real name is Tomas Guil Velasquez. The marketing and PR lady Mrs. Montisci of Gallery Manufactum Mrs. Montisci pointed Samot art out to us. Samot who was born in Tenerife did much work with sign writing on glass and on metal for bars and the like in Madrid Spain. There in the Spanish capital, he learned to appreciate special results. caused by those materials. They made him curious to research further. Eventually, he started experimenting with metal for fine art based on the same technique. He painted on wooden backgrounds as well. You certainly have seen Spain art made with metal on walls where pictures were embossed on copper without using any paint. 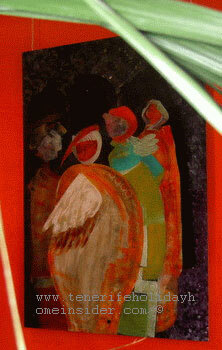 Samot Spain art exhibited in Tenerife. However, Samot does different wall art painted on metal. Some of it is rather colorful. Make out a different Samot Spain art, as shown beside. Here, the style is pretty abstract but alludes to females dressed in long robes. Most vibrant colors prevail while purple on metal joins them and warrants another captivating metal wall art. Samot also has creations that look like elaborate embossings with color which I didn't see at Manufactum. Others, are much more simple and almost abstract. It's thrilling to discover a fairly new art form, such as Spain metal wall art paintings, although based on sign writing which is no novelty. Samot doesn't only paint with oil on metal, to the best of my knowledge. However, painting on metal presented challenges which took him time to overcome. 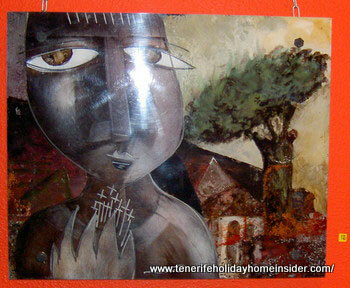 Eventually, the very promising Spanish Tenerife artist found a way to avoid oxidization. Samot Guil Velasquéz has been compared to Salvador Dali the expressionist, on occasion. In 1994, Samot received the highly valued Oscar Dominguez Prize of Tacoronte for his innovative achievements with modern art. Tomas also used his technique on wood and on other materials. There is one wall art in brown tones. Indeed, it lacks the rainbow colors, but shows an amazing original talent for drawing movement in that particular work of art. One would have to see it from close up to make out if it is also Spain metal wall art. There may only be one safe https link about Samot art here although not metal wall related. No, I am neither getting any commission in case you want to buy it nor am I paid for providing the url. You can type the link www.samot.info to read the artist's bio but should wait perhaps before doing more until the last unsafe hurdles for connecting have been removed. From Spain metal wall art back to Spain art in the street with more Tenerife surprises.